Hi all, We went to a fund-raising event last night for the S.P.C.A. The event was called "Funny Bones". Click here for the SPCA for our county. They also have a wonderful program called SOS. 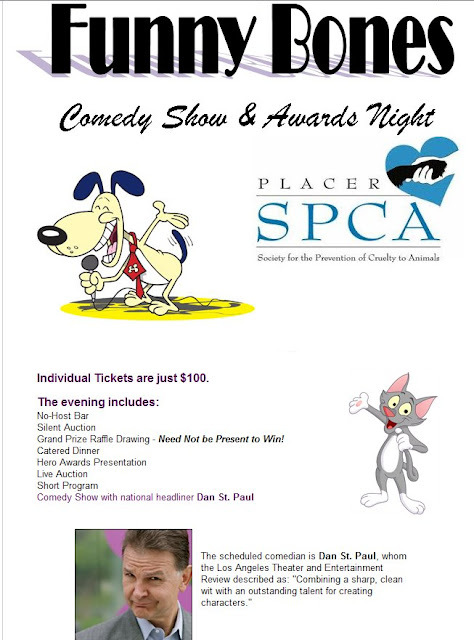 Before you find yourself in a position where you can no longer keep your companion animal, contact the Placer SPCA! The event had silent auctions, live auctions, dinner, dessert. The Auctioneer was Keith McLane and acomedian named Dan St. Paul. The auctioneer for the evening was Keith McLane. He did an amazing job at getting people motivated to bid and raise money for precious animals that need medical attention and their forever home. is the host of a new show on HGTV, called Auction House. Keith L. McLane, BAS, is one of the country's preeminent fundraising auctioneers and special appeal/fund-a-need experts. He holds an MBA from The UCLA ..The show will premier in May. Each 30-minute episode of Auction House will follow a group of potential home buyers from the beginning of the auction process to the end. Shows will be taped at various locations across the U.S. It is planned to debut sometime in the summer. You can click here for Keith's website. Dan St. Paul is well know for his comedic version of the first baseball game ever played. Dan has appeared on several episodes of “An Evening at the Improv”, plus numerous shows on VH-1, MTV, and Comedy Central. Since then, he has opened for such superstars as Jerry Seinfeld, Natalie Cole, Dwight Yoakum, Smokey Robinson, and Vince Gill. In a testament to the class of his act, Dan even opened for the San Francisco Symphony. Click here to see Dan's website. One of the auctions was 5 cakes that were to be auctioned off. One of the cakes held a "Winner" tag for a heart shaped diamond necklace. The cakes were all different flavors.... Decadent Chocolate, Coconut Cream, Chantilly, Strawberry and Carrot cake. Needless to say, we didn't win, however the money was well spent to raise money for the S.P.C.A. It was the most expensive dessert we have ever had.They were very clever hiding the winner tag under the cake. If you didn't win, you got the tag that said, "Sorry, you didn't win, but enjoy the cake. Our cake was Strawberry cream and it was delicious! It got a little smashed by the time we got it home. Another couple at our table bid on the Coconut cream cake and actually won the necklace. I should taken photos of these beautiful cakes. We were very happy to attend this event and donate. More dogs and cats will be saved and get the medical attention they need. Sounds like a fun event. And who doesn't love cake?! What a wonderful event. Both of our "boys" are rescues. These organizations do terrific work. This looks like a fun event for a worthwhile cause! Thanks so much for stopping by and following...I am a new follower, too! That must have been some fundraiser. How sweet of you and your husband to donate. What a great cause and a fun event! That's wonderful that fundraisers like these exist! Your cake looks yummy- and hubby was so generous to bid on it! I hope the outcome of the fundraiser was generous and will benefit many animals. Your cake looks soooo good!!! HI Linda... just popped in to share with you about my baked eggs... Your interest inspired me to post about them today at http://wwweaglewing.blogspot.com/2012/05/my-early-morning-garden-tea.html. Hope you can stop in and visit... You have a very exciting blog here... I love the photos.... such a fun visit!